Another version of the same nuggets coated with chickpea crumbs. The ground meat: If you can specify, get your meat double- or triple-ground which simply means it goes through the grinder two or three times. I prefer this for a finer texture more akin to commercial nuggets. Secondly, a mixture of dark and white meats is most ideal. If you prefer all white meat, it will just be less juicy because it has less fat. Breadcrumb + Gluten / Grain-free substitution: I use Sha Sha Organics (Canadian company) spelt bread crumbs because it is all natural, but any bread crumbs would do. However please watch out for additives (like soybean oil bleck) and preservatives in commercially produced bread/panko crumbs - many of them contain them so I do caution you to read the labels so you are at least aware of what you are ingesting! If in doubt, make a batch of your own bread crumbs and keep it in the freezer for convenience. ADDED April/2017: Watusee Foods sent me some of their organic chickpea crumbs to try (yes you read that correctly, crumbs made from 100% chickpeas!!) The chickpea crumbs are as you can expect, a denser crumb (aka not as light and airy as say panko or white bread crumbs) but it is remarkably similar in appearance, texture and taste to the spelt crumbs I have always used in the past! The girls did not detect a difference at all. Have a look at the pictorial evidence in this post (I've indicated under the images which is spelt versus chickpea crumbs). Isn't it convincing? This is a huge win for my family since we now limit our consumption of grains like spelt and other breadcrumbs. 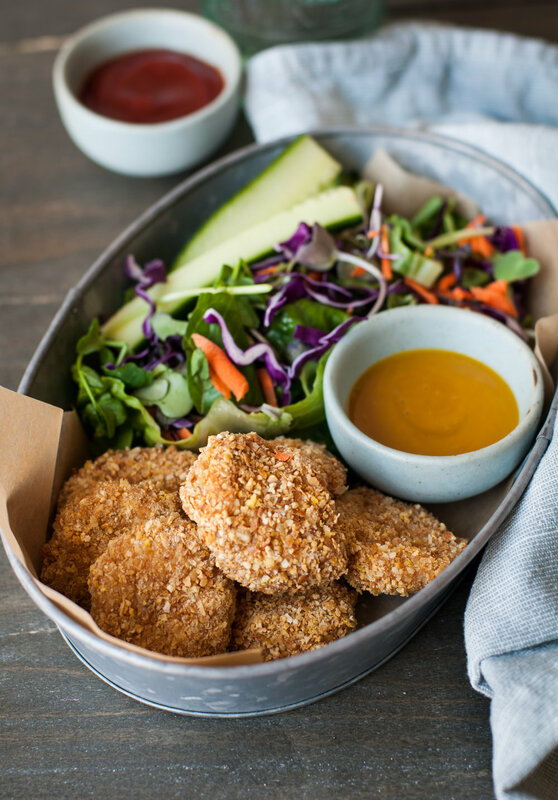 I can once again whip up a batch or two of these easy chicken nuggets as well as another family favorite Crispy Chicken Cutlet Sliders for quick weeknight dinners or weekend lunches. Woot! Dairy-free substitution: Instead of using grated Parmigiano-Reggiano cheese, you can sub in an equal amount of nutritional yeast for a dairy-free version. Not familiar with nutritional yeast? Read more about it here. Make + Freeze: Nuggets freeze very well for a couple of months. After you form and coat them in crumbs, lay and freeze them in single layer on a parchment-lined baking sheet for a couple of hours or until firm. Transfer them into a freezer zip-top bag with the air pushed out. To use, bake directly from frozen in a 375f oven for about 25-27 minutes. Recipe makes 24 small nuggets. 1. In a medium sized bowl, mix together the bread crumbs and grated Parmigiano-Reggiano (or nutritional yeast), plus just a pinch of salt. 2. In another bowl, mix well the ground chicken with the 1 tsp of salt. 3. With your hands and a tablespoon measure, scoop about 1 tbsp of meat and place into the middle of the breadcrumb mixture. Using just your finger tips, scoop and toss crumb mixture from around the meat on top of it. The crumbs makes it less "sticky" so you can now form a flattened nugget by pressing down gently, about 1/2" thick. Don't flatten it too much or else it cook more dry. Lightly toss it around a bit more in the crumb mixture until evenly and well coated. You may use gentle pressing motions to encourage crumbs to adhere. Repeat until all the ground meat is used. There should be enough meat in 1lb for about 24 nuggets. That is IT! 4. At this point the nuggets can be frozen for use another day: lay nuggets in a single layer on a baking sheet lined with parchment and freeze for an hour or two until firm, then transfer into a freezer bag or freezer-safe container for up to 3 months. 5. To bake, preheat the oven to 375F (or 190C). 6. Place nuggets on a parchment-lined baking sheet - either directly, or on a wire rack set atop the baking sheet. Bake 25 minutes. Frozen nuggets can go directly into the oven in the same way, just add an extra 5 minutes to the baking time. My girls like to dip in ketchup (Heinz makes an organic no additives version :)) but I prefer a quick honey-mustard sauce by stirring equal parts honey and spicy brown mustard. Yummo. I tend to serve these with baked sweet potato fries and a simple steamed vegetable for a well-rounded family meal. It doesn't get much simpler than this. Disclosure: I was sent free product from Watusee Foods in exchange for an honest review. Accepting free products from companies allows me to test out out new items and share only the successes with you! The opinions above are my own. And to be honest, I have not stopped using chickpea crumbs for no-fry gluten-free breading ever since - it’s amazing!